NYSERNet is a private not-for-profit corporation created to foster science and education in New York State. Its mission is to advance network technology and related applications to satisfy needs common to the institutions comprising New York State’s research and education community, providing a forum for exploration of the opportunities and challenges these innovations present. NYSERNet has delivered next-generation Internet services to New York State’s research and education community for more than 25 years. NYSERNet members include New York State’s leading universities, colleges, museums, health care facilities, primary and secondary schools, and research institutions. NYSERNet’s Board of Directors is composed of CIOs and other senior personnel drawn from and representing New York’s leading research universities and institutions. Founded in 1985, NYSERNet led efforts in 1987 to deploy one of the nation’s first statewide regional IP networks, the first in a succession of high-performance networks built by NYSERNet, two of which resulted in commercial spin-offs. NYSERNet nowadays offers members commercial Internet access via The Quilt, leveraging the aggregate buying power of its combined membership to secure attractive terms and pricing from major ISPs. The NYSERNet Data Center is the newest addition to the suite of facility-based services now offered to members. The Data Center is located adjacent to NYSERNet’s network POP in Syracuse, extending NYSERNet’s optical and Research & Education (R&E) networks to the center. The resulting network infrastructure is robust and flexible, enabling participants to connect to their equipment via GigE, 10 Gigabit Ethernet, Fibre Channel SAN, the NYSERNet R&E network, and the commercial Internet. NYSERNet’s original facility went live in June of 2007. It was designed to be commercial grade in all of the best ways. A shortcoming determined several years after construction was that the building’s floor loading capacity was insufficient to handle heavy cabinets. 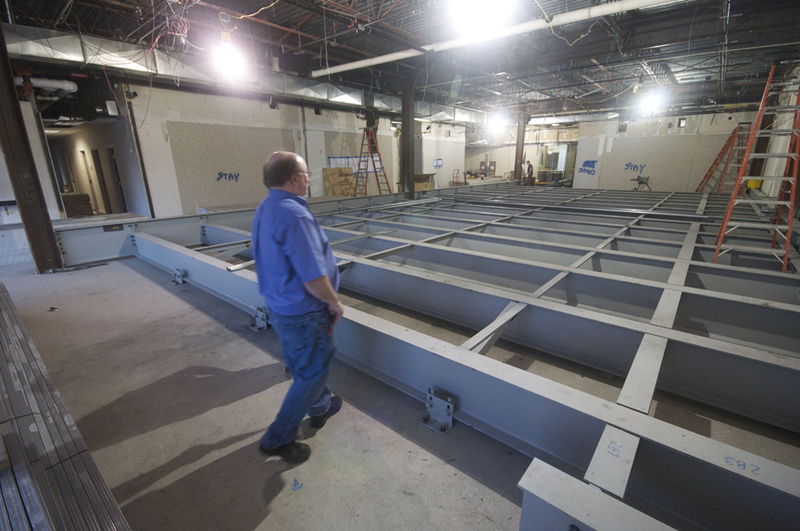 As the machine room grew to near capacity, the NYSERNet Board of Directors opted to build another in an adjacent space. The key modification to this space was the steel deck being built underneath the raised floor to accommodate 2,500-pound cabinets. Stephen R. Kankus, NYSERNet Chief Operating Officer, explained that the concept for the original data center was that it would serve as a shared colocation site for systems integral to NYSERNet members’ disaster recovery/business continuity strategies. A working group composed of 23 individuals representing more than a dozen member institutions worked to develop specific requirements and to assess potential locations and designs. The final design called for a 50-cabinet facility. Syracuse was chosen as the location because it would allow NYSERNet to leverage existing staff in the Syracuse office, it is close to all but one of NYSERNet’s largest member institutions, and is not prone to any natural disasters – other than getting a lot of snow in the winter. The expansion was approved in January 2014, with construction commencing in August. Kankus said he expects the project to be complete by end of the year. The new space looks like most any machine room except that underneath the raised floor there is a platform of steel beams and girders that transfers the weight of the raised floor and everything that rests upon it to six columns, which then transfers the load to the building’s foundation three floors below. As a result, the expansion can accommodate 53 2500-pound cabinets. The new space leverages most of the power plant (generator and UPS) assembled in 2007, which has plenty of capacity remaining. This helped keep the cost down to about $1 million, or $20,000 per cabinet. In order to accommodate the target of 53 cabinets, NYSERNet likely need to add UPS capacity, but that is years off, according to Kankus. Participating members for this project included NYU, Columbia University, Cornell University, Hofstra University, Stony Brook University, Marist College, the American Museum of Natural History, RIT, University at Buffalo, and SUNY Geneseo. Most participants are extending their LANs to the facility using waves or Ethernet services provided by NYSERNet. Kankus added that most applications are DR/BC, but it is expected to see more production applications in the future and that some members already are deploying production applications in the facility. NYSERNet continues to grow participation in existing services and to evolve new ones. Market influences and member demand lead NYSERNet to expand the number of commercial ISPs it offers members from two to six. NYSERNet also formalized an education program, offering members a suite of hands-on technical training courses, revitalizing its annual technical conference, NYSERTech, and expanding its role in promoting and delivering the annual New York State Conference of Higher Education CIOs. Leveraging its core competency in network operations, NYSERNet continues to innovate and looks forward to the challenges and opportunities that lie ahead.